pUNO plasmids feature a wide choice of native and fusion genes. The gene of interest is under the control of of the strong and ubiquitous mammalian promoter, EF1α/HTLV. 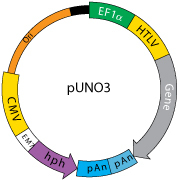 pUNO plasmids can be used for in vitro or in vivo transfection experiments. Invivogen also provides pUNO-mcs plamids, designed to serve as control and/or cloning vectors. • hEF1/HTLV prom is a composite promoter comprising the Elongation Factor-1α (EF-1α) core promoter and the R segment and part of the U5 sequence (R-U5’) of the Human T-Cell Leukemia Virus (HTLV) Type 1 Long Terminal Repeat. The EF-1α promoter exhibits a strong activity, higher than viral promoters and, on the contrary to the CMV promoter, yields persistent expression of the transgene in vivo. The R-U5’ has been coupled to the EF-1α core promoter to enhance stability of DNA and RNA. Each restriction site is compatible with many other enzymes, increasing the cloning options. • SV40 prom: The Simian Virus 40 promoter allows the expression of the blasticidin resistance gene in mammalian cells. - Bsr (blasticidin resistance gene): The bsr gene from Bacillus cereus encodes a deaminase that confers resistance to the antibiotic Blasticidin S. The bsr gene is driven by the SV40 promoter in tandem with the bacterial EM7 promoter to allow blasticidin selection in both mammalian cells and E. coli bacteria. - hph: Resistance to Hygromycin B is conferred by the hph gene from E. coli which encodes a phosphotransferase. The hph gene is driven by the CMV enhancer/promoter in tandem with the bacterial EM7 promoter allowing selection in both mammalian cells and E. coli. • βGlo pAn: The human beta-globin 3’UTR and polyadenylation sequence allows efficient arrest of the transgene transcription.